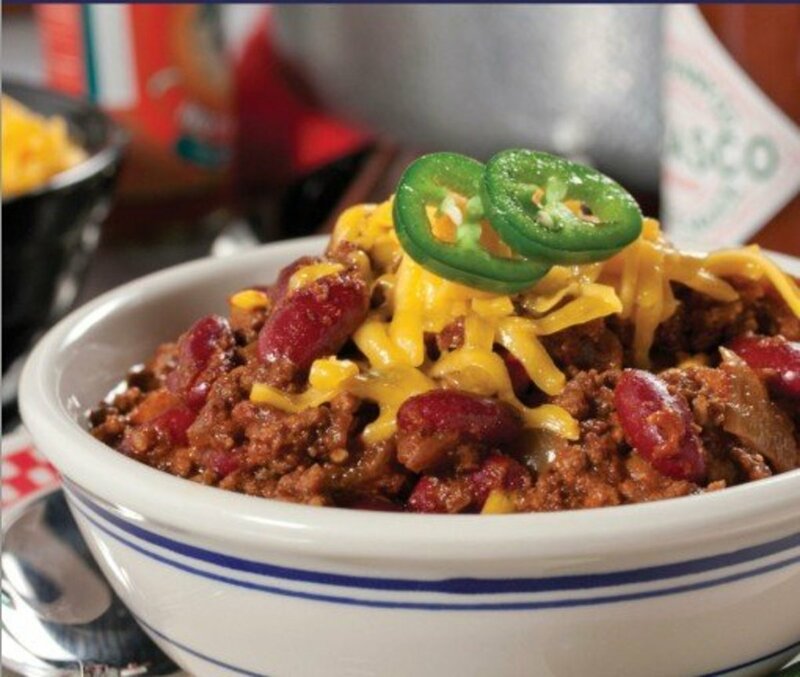 Chili is serious business and chili lovers are as fanatical about their concoctions as New Yorkers are about the Yankees. They hold chili cook-offs and competitions for the best chili powder and even write poems and odes to chili. Most chefs create a signature chili recipe and there’s even a chili organization, the International Chili Society (ICS), which has been in existence since 1967. The origin of chili is widely debated by culinary historians, although the modern dish, chili con carne, probably originated in Texas sometime after the Civil War. That being said, the amalgam of spicy peppers, meats and herbs is not the monopoly of Texans. The potage dates back to the Incas, Mayas and Aztecs. Since each chili lover has his own unique palate, the array of recipes is dizzying. But just like the top chefs, you can develop your own signature recipe. How? First, we'll discuss the two most important chili ingredients: fresh and dried chile peppers. Fresh hot peppers adjust the heat/spice level while the chili powder or dried chiles you choose contribute toward both flavor and heat. For the sake of clarity, in this article we use the spelling "chile" for hot peppers and "chili" for the dish and the powder blend. Chili Poll: How Do You Like Your Chili? After researching for this section, visions of chile peppers were dancing in my head! So what's the skinny? 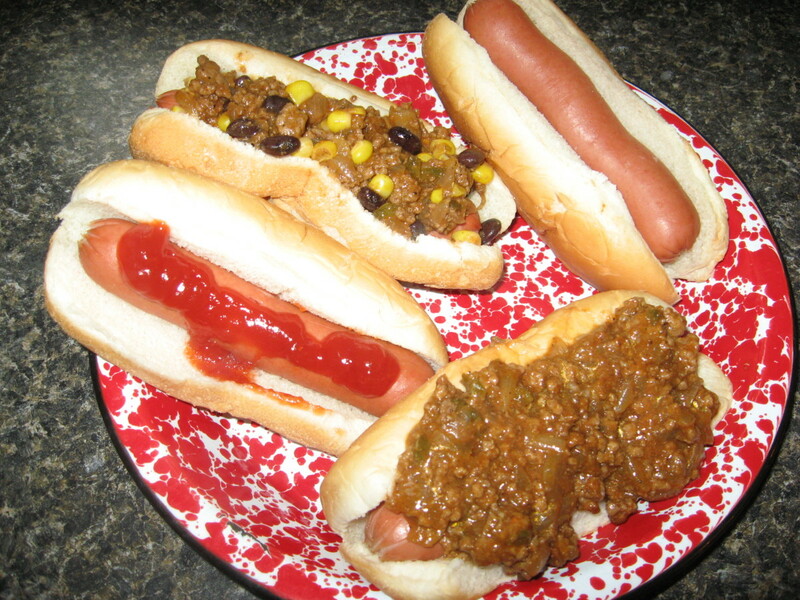 Hot pepper adds to chili what Angelina Jolie adds to Hollywood: heat and flavor. The Scoville scale was developed to measure chile heat levels. See the chart below, which includes both dried (used in chili powder) and fresh peppers, to make a selection based on your heat preference. Be very careful when handling chiles; use gloves or plastic bags on hands and don’t touch nose or eyes. Remove seeds and veins to decrease heat. Of course, this is just a starting point. Heat levels of individual peppers vary a lot due to seed stock, climate and soil quality. And each chile also has its own unique properties. For example, dried guajillos are rich, smoky and complex but add little heat. Fresh jalapenos can pack a punch but don't have staying power. Habaneros produce a tonsil-scorching pot of chili. Cayenne adds immediate but not lasting heat. We like Ancho in our chili powder blend, as it adds a lot of flavor without much heat. Sample fresh peppers before adding them to the pot and experiment with dried peppers for your own unique chili powder blend. Peppers have more than just culinary value. A fun fact: the prize for the hottest naturally grown pepper goes to the Bhut Jolokia or ghost pepper, which has been used successfully in eastern India to repel obnoxious elephants! Update 2/20/2012: The Trinidad Moruga Scorpion pepper was recently named by the New Mexico State University's Chile Pepper Institute as the world's hottest pepper, with a heat on the Scoville Scale topping 1.2 million units! The single most important ingredient of winning chili is chili powder, which is about 80% chile pepper blended with other spices like coriander, oregano, cumin, coriander, cinnamon, allspice, etc. A cheap blend will make boring, flat chili so splurge on high quality seasoning or make your own chili powder. In a pinch, we use Penzey's chili con carne blend. Many Californians vouch for Gebhardt's (the original chili seasoning), while others swear by Adams, Mexene or Spice Hunter chili powder blend. There is nothing like the complex flavor of homemade chili powder. Dare to make your own! It's quick, easy and raises chili to new heights. This chili seasoning recipe creates a mildly spicy, flavorful blend with a touch of smokiness. Stem whole dried chiles, removing most of the seeds. Toast chiles and cumin seeds in a cast iron or other heavy skillet over medium heat, moving constantly so the spices don't burn, for 5 or 6 minutes. Remove from heat and allow to cool. When cool, place chiles in a spice grinder or blender with garlic powder and oregano. After grinding into a fine powder, allow dust to settle before opening the lid. *See "Dried Chiles" chart in my recipe article "Sweet & Smoky Mexican Mole" for tips on choosing dried chiles by flavor. It's best to start with a couple of hot peppers and gradually add more until you reach the desired level of heat. Cocoa and coriander add both depth and dimension to chili. Dark beer makes this dish extra special. Guests will beg for your recipe! Add beans the last 20 minutes of cooking to avoid overcooked, mushy beans. You can substitute canned tomatoes for fresh. I've recommended high quality products in the Amazon links. Simmer chili for at least an hour. This is a good make-ahead dish because flavor only improves overnight. 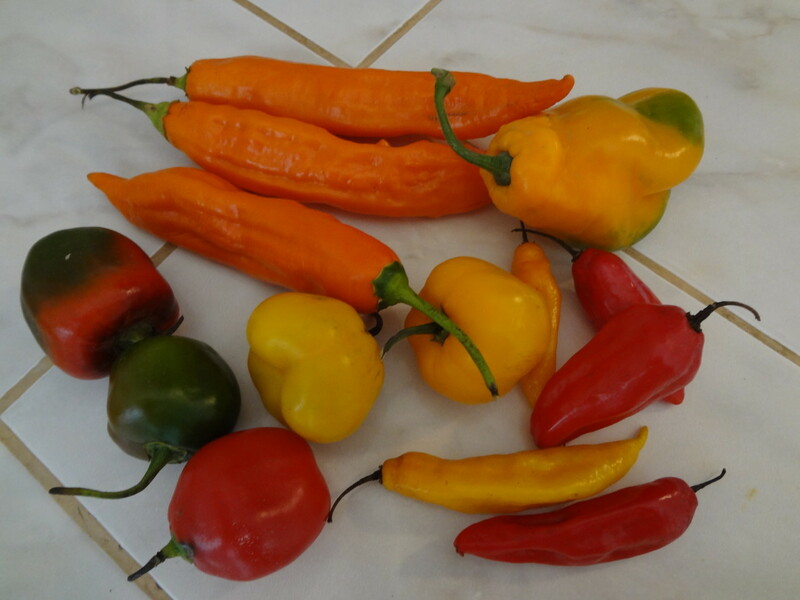 Aji marisol and rocoto chiles are readily available in Peru, so I use a few of each in my chili. if you have any questions concerned chiles available in your area, feel free to ask. Now that you understand the workings of chili, be creative! Approach a pot of chili the way Michelangelo approached a blank canvas: as a future work of art. If you have a delicate palate, start with only 2 tablespoons of chili powder for your custom recipe. Choose chile peppers with a low Scoville score. I recommend poblano peppers, which tend to be milder, and red, yellow or orange bell peppers. Fire roast for more flavor or simply dice and sauté with onions and garlic. If you enjoy stronger flavor and hotter spice, you can up the ante by using the full amount of chili powder recommended below. Choose hot peppers that rate higher on the Scoville scale. If your family doesn't agree on heat level, make a batch of mild chili and spice up individual portions with diced hot chiles or cayenne. My recipe makes a medium spicy, slightly smoky chili. Adjust heat up or down according to your preference. Pour 3 tablespoons of olive oil into a heavy-bottomed pot on medium heat. 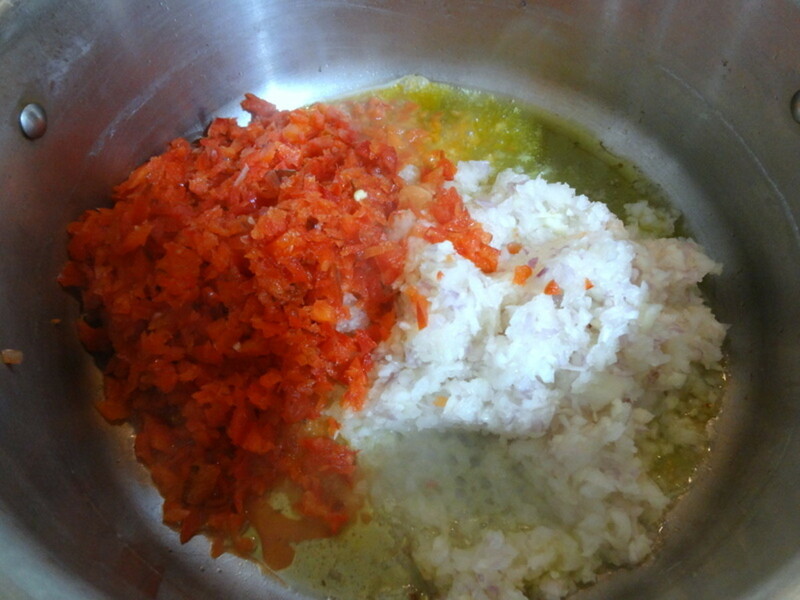 Add onions and garlic (and diced peppers, if not roasting). Cook until soft, about 8 minutes, stirring frequently. Push vegetables to the side and quickly saute the bacon or pork loin. Add chili powder, cumin, paprika, coriander, oregano and ground meat. 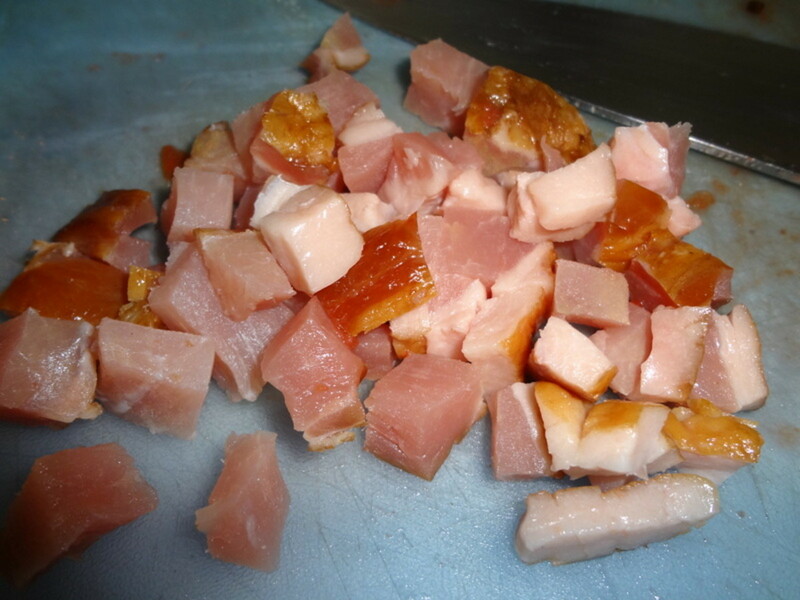 Break up meat with a wooden spoon or spatula and cook about 10 minutes, or until no longer pink. Stir in Worcestershire, cocoa powder, salt and pepper, tomatoes, tomato paste and liquid. 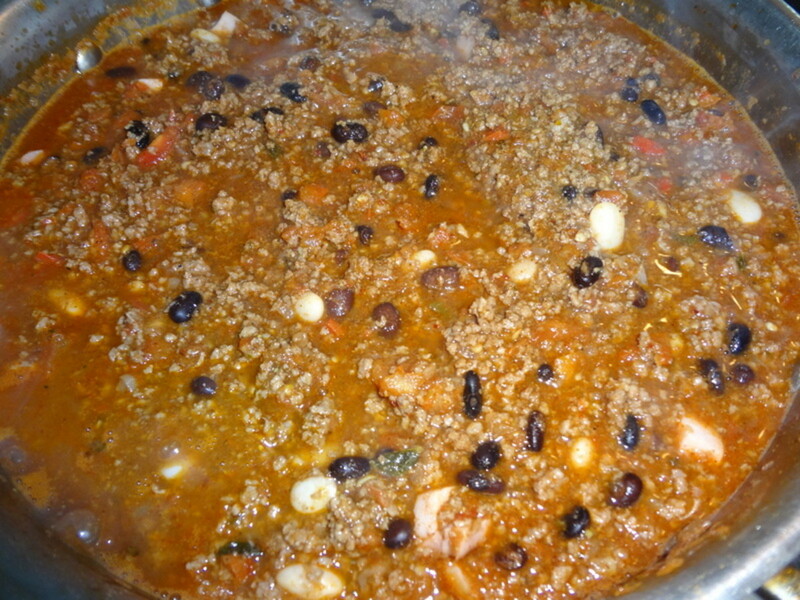 Reduce heat to low and simmer for 1-2 hours, stirring occasionally to ensure the chili doesn't scorch. 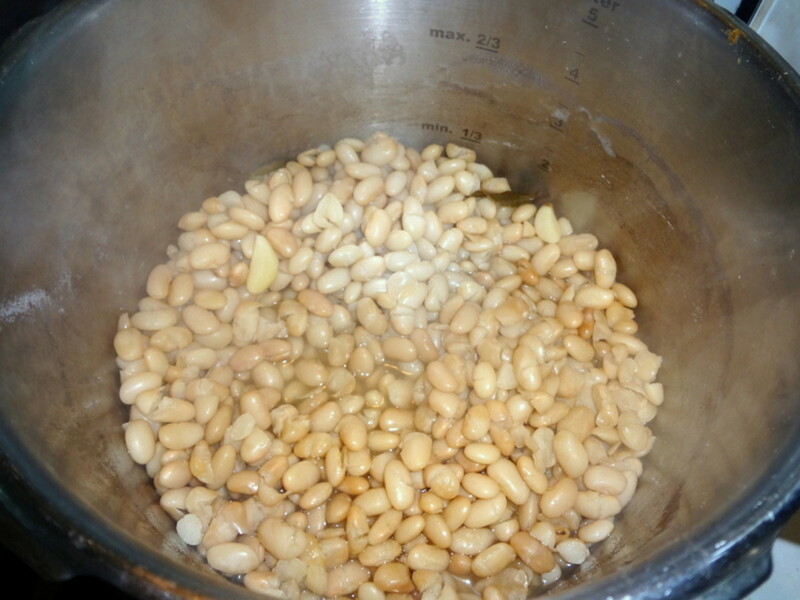 Add beans during the last 30 minutes of cooking. Taste and adjust salt. 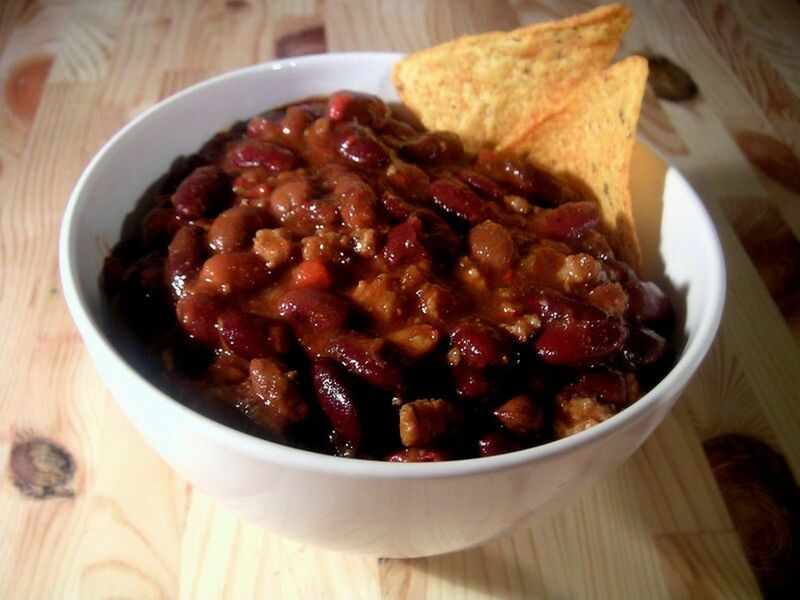 *Garnish chili with: chopped green or red onion, cilantro, shredded cheese, corn chips, sour cream or Greek yogurt. 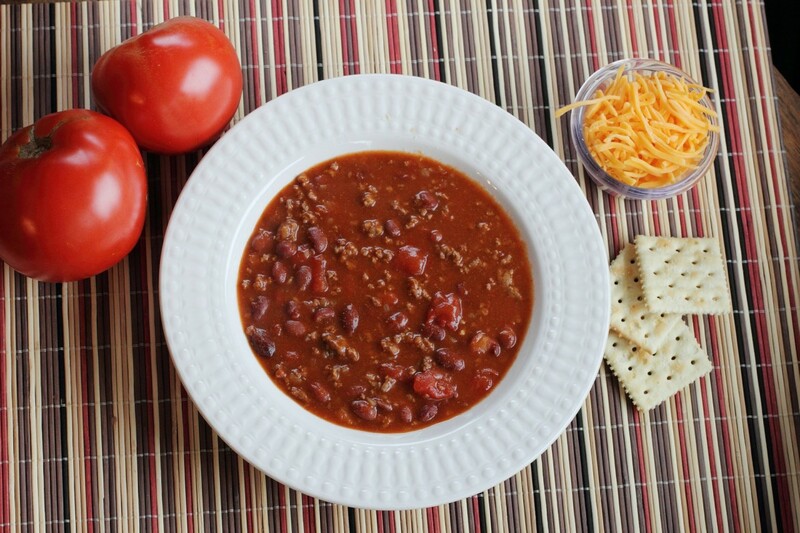 Chili is great served with biscuits, cornbread, french bread or even cinnamon rolls. Yes, I know... chili and cinnamon rolls is a midwestern thing my hubby remembers from elementary school. If you enjoy complex chili, try coaxing more flavor from tomatoes and peppers by roasting. Roma or other meaty tomatoes work best for this method. Roasting tomatoes in a 400 degree Fahrenheit oven will sweeten and concentrate their flavor. First, seed the peppers and remove their tops. Slice tomatoes in half lengthwise, place on a baking sheet, skin side up, and drizzle with olive oil. Bake in 400 degree oven for about 30 minutes, or until tomatoes shrivel. Let cool. Peel, chop coarsely and add tomatoes and juices to chili. If you like smoky chili, try fire roasting peppers and tomatoes. Prep as above and broil under the broiler for 15-20 minutes, watching carefully, until tomato and peppers are charred and blistered. Peel, coarsely chop and add to chili. 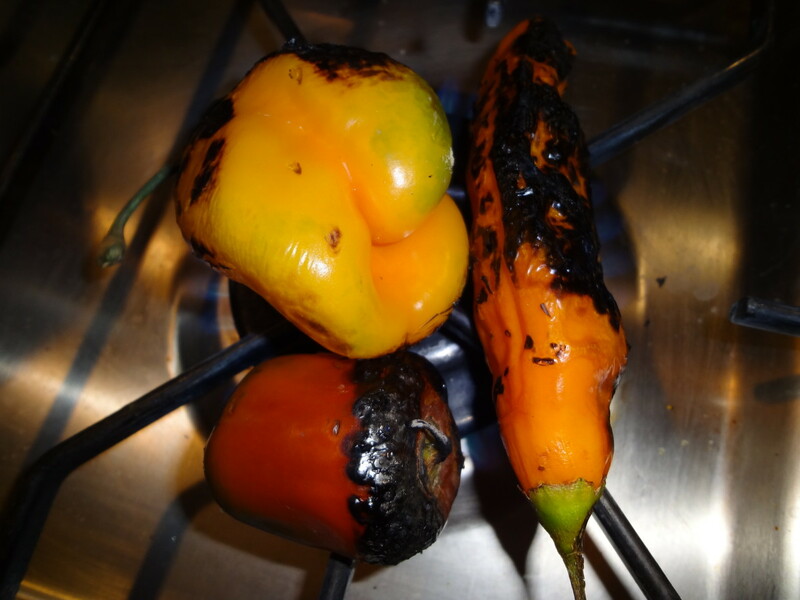 Since I own a gas stove, I oven roast tomatoes while fire roasting peppers on the gas burner, as seen in the photo. Alternatively, you can purchase fire roasted tomatoes and chiles. Amazon links are included in the recipe section. I enjoy the warmth and depth cocoa powder and dark beer adds to my recipe. I also choose coarsely ground beef, although some cooks prefer cubed beef chuck for firmer texture. 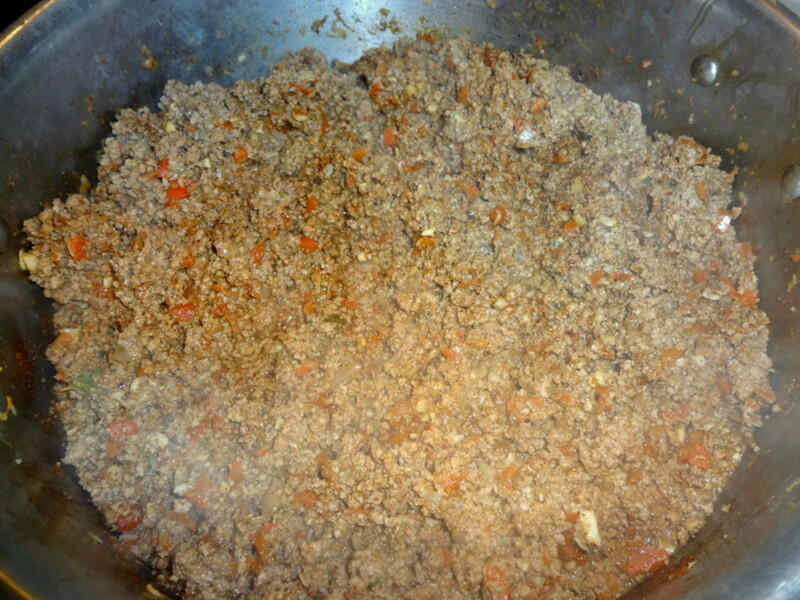 Ground pork or bulk italian sausage can be added to the beef blend for unique flavor. Ground turkey would be a healthier alternative to beef. I always add beans to my chili. Since canned beans are expensive and not readily available, I soak one bag each of black and canary beans (available in Peru) overnight. Then I pressure cook the beans before adding them to the chili. For U.S. cooks, I recommend either pinto, black or red beans. If you enjoy thicker-skinned, firmer beans, try kidneys. You'll need about two cups of liquid for thick chili. Try red wine, beer, beef broth or just plain water. Other possible chili additions are: liquid smoke, wasabi for a touch of the exotic, sugar, orange juice, soy sauce, vinegar, mustard, mushrooms, celery, zucchini, bacon, chicken or textured vegetable protein as a substitute for meat. Use your imagination and add your favorite ingredients. What does cocoa powder do to chili? Cocoa powder adds another layer of flavor to chili, as does the dark beer. Mexican mole uses a similar method. Cocoa or chocolate also contributes to the depth of flavor in this traditional sauce. @vespawoolf Very enjoyable read! Keep up the good work! Thanks for reading Beverly Johnson! This looks amazing! I was just saying last night how I love chili but have never made a good bowl of my own! I will love to try this. Maybe for make and freeze ahead. Ideal because we just got our chest freezer. This is excellent. I'm pretty tired right now but I'm going to come back and read this again tomorrow. Nice work. 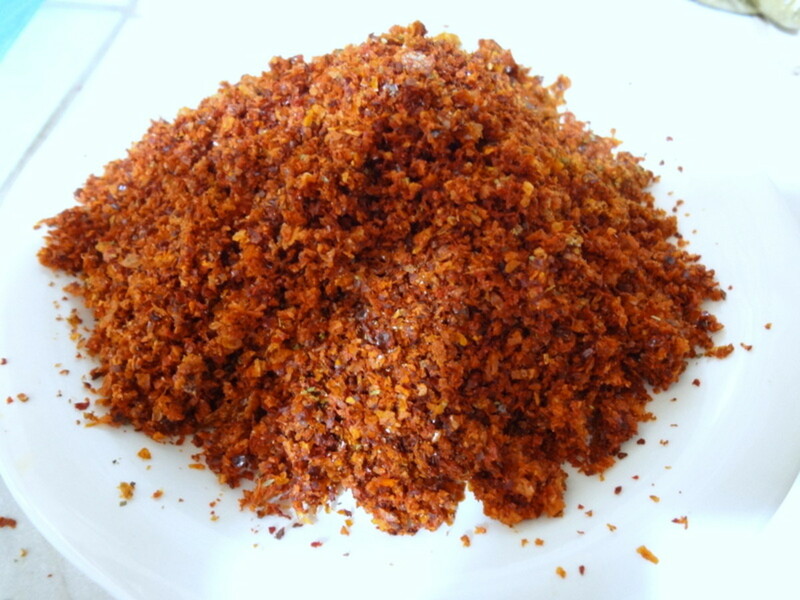 RTalloni, I´m glad you´re going to try this homemade chili powder blend. It makes all the difference in the world with chili. Enjoy! I've been thinking of make a pot of chili soon and I see that I definitely needed to read this information. I'll be back to check this out so I can practice making a homemade chili powder blend according to your tips. Thanks for valuable info! abetterwaytolive, I'll mosey on over your way and take a look at your chili recipe Hub. Thanks for your kind words. It's nice to meet you! Wow, so informative! I'm currently writing a chili recipe hub that I'm going to publish in a couple of days. Your information is so organized and detailed. I am extremely impressed and can't wait to read more of your hubs. Voted up and awesome. Your chili recipe looks great. Around this area they add macaroni to their chili. I had never made it that way and never had it like that while growing up. One time my husband insisted I add macaroni to my chili. I did the macaroni sucked up all the juice. In front of company he said "When are you going to learn how to make chili." Bad move on his part he didn't get chili for at least another 15 years. Voted up on your hub. newusedcarssacram, I hope you have a chance to try it. As a spicy food lover, you will really enjoy it. Thanks for coming by! stayingalivemoma, this chili is delicious made with a milder dried chile like New Mexico or Ancho. They give the chili plenty of flavor without the heat. Yes, it is wonderful with all the goodies on top! Thanks so much for coming by. PeggyW, we enjoy the depth of flavor imparted by the cocoa powder and dark beer, although using dried chiles is really the secret to wonderful chili. I'll send some over right now! lol I really appreciate the votes and share. I just love spicy food. 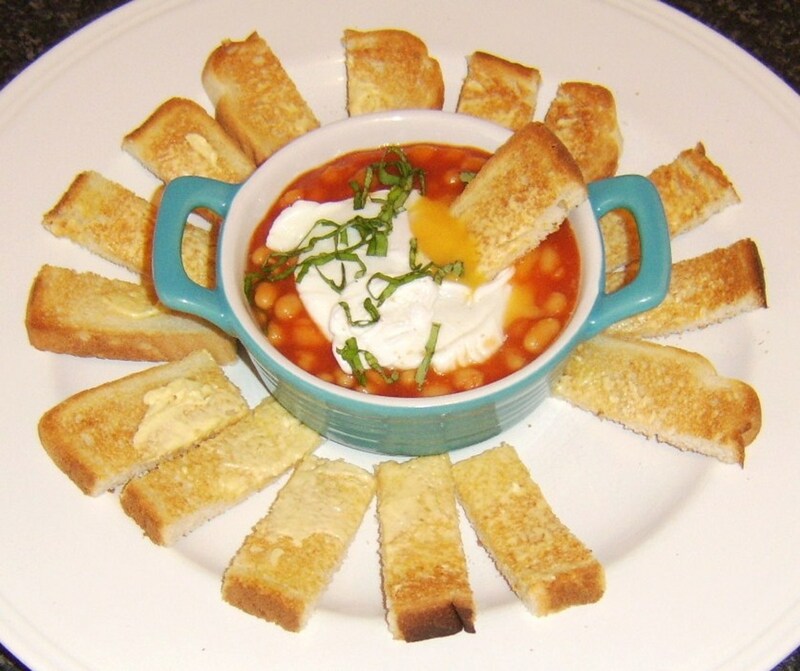 Thanks for sharing this mouth-watering recipe. I would love to try this soon. A chile powder recipe - I love it! Rated Up and Hot. Hey there Vespa! I love chili, but not spicy. I can't handle spicy foods much anymore like when I was younger. But, I love a good bowl of chili with sour cream, cheese and crackers! Now that we have had our first cold spells...not that they last all that long...but chili sounds good. Really enjoyed reading this hub about chili and also your homemade from scratch chili recipe. I found it interesting that you added cocoa powder and also some dark beer. I'll bet that it is delicious!!! Do you take orders? Up votes and passing this on to others. Jen, I hope you can get your hands on at least some of these delicious dried chiles. I especially enjoy the smoky flavor of chipotles. Please let me know what you think! I'm whipping up a batch tomorrow, so I'm going to refresh my photos and some other information while I'm at it. Thank you for coming by. I really appreciate your comment and the opportunity to meet you here on HP! Gmarquardt, it's really nice to meet you on HubPages! I look forward to seeing you around and thank you for taking the time to read and comment. I have a Peruvian student in my class this year and I look forward to reading your hubs and learning more about Peruvian foods and culture! Green Lotus, I just love going to the farmer's market. What yummy produce! Enjoy the chili and thanks so much for your vote and comment. I love this recipe and can't wait to try it this weekend as I'm going to our farmer's market. So many fresh from scratch ingredients and I love the idea of adding a bit of cocoa! Thanks and rated up! Turtlewoman, chili is a great make-ahead meal. It's especially delicious with the homemade chili powder. Thank you for taking the time to comment! Thanks for the kind words, MelChi! This sounds delicious! I love the way you've broken the article into recipe, interesting information and the different types of chilies! Voted up!! You're welcome, BethDW. The Scoville scale sure helps when picking chiles for cooking. Thank you for coming by! I'm loving your hubs! So much great information here, the Scoville scale I found particularly interesting (I have never heard of that before). Thanks for sharing! Ancho chiles are actually dried poblano peppers. My next hub will be a recipe for Mexican mole sauce, along with a Scoville chart of dried peppers. Thank you for stopping by and commenting, Express10! I like my chili very spicy but hadn't heard of the ancho pepper. I am curious about this one and will probably try it. Great hub. 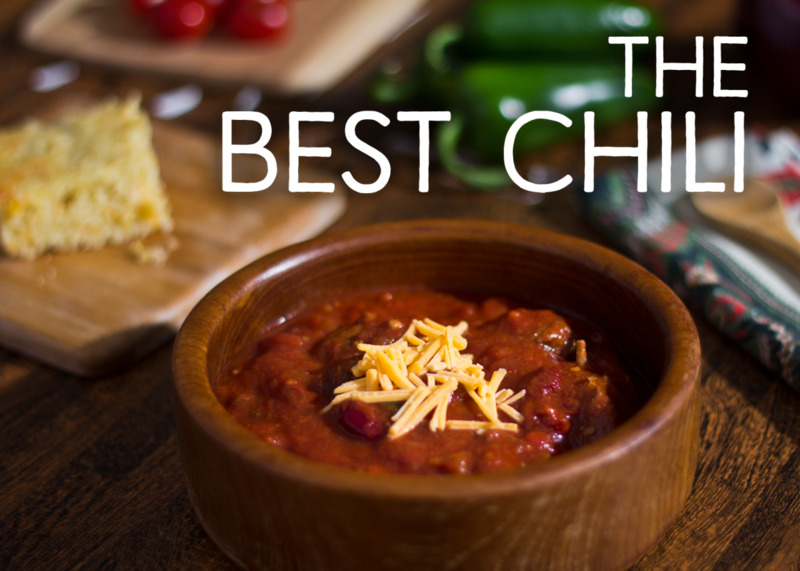 DeborahNeyens, that qualifies you as a chili expert! I'd love to hear about this year's chili challenge if you get the opportunity. Thanks for dropping by. This is an excellent hub. I love all the good information you have here, including the chart on chili hotness.My husband and I are gearing up for a chili challenge we do for charity every year. It's this Sunday. It will be our 10th year, and we are three-time people's choice award winners! We change up our recipe a little bit every year, but the one constant is a homemade chili paste made with dried anchos from our garden. I haven't tried them either. I'd like your feedback if you have a chance to try ghost peppers. Thanks for your comment! I love chili and the hotter the better (although I've not yet tried the bhut jolokia peppers yet in my chili). Great hub. Thanks for dropping by! Please tell me how your chili turns out! Spicy please! What a great hub about Chili! Definitely need to pick up some new ingredients. Perfect on a chilly New England day. Thanks, vespawoof. This is a great hub about chili and as someone who love chili I was drawn into this hub from the first line! Thanks for all the interesting details and the recipes, you have done a wonderful hub! Voted up, useful and shared! You had me from the opening line...chili is serious business. Loved the hub and looking forward to reading more from you! Thanks for dropping by and let me know how the chili comes out. I look forward to reading more of your writing! I finally know how to judge peppers! And adding cocoa made since when I read it, but I never would have thought of it. Thanks for the tips,and for the follow. I will have to try the test of the recipes, now! Thank you for dropping by and I hope you have a chance to try the recipe! One of my favorite foods and I love the scale. I'll take mine mild please. Voting this Up and Useful. b. Malin, thanks for dropping by and I hope your husband gives the chili a chance! i Love Chili, my Husband NOT...However, I'd be tempted to try your Recipe, making it "Mild"...then, I think he would give it a try. Thanks for sharing. I look forward to Following your Hubs, Thanks for becoming a Follower of mine, and Welcome to Hub Pages, Vespawolf. Rebekah, thank you so much for taking the time to do the title search. The information is very helpful and I will look into linking the hubs together. Hi Vespa, I came back to take a look at the recipe and read through your comments. Actually I just did a search for 'signature chili recipe' and your hub is on page 2, not bad! It is listed under your original title. I think your title was fine, as some people do want to find signature recipes. There were 1,370,000 results! A page 2 ranking is excellent in that regard. It now has an easier chance to move onto page 1. Can't wait to try the recipe! Another tip ~ you can link your recipe hubs together with links in the text. Please let me know how your chili turns out! mmm... I love chili and I've learned a lot from this article! Wow, never thought of adding cocoa, but I am definitely going to give it a try! Great hub! Fascinating hub with lots of great information in addition to the recipe. A good candidate for Super Bowl Sunday for sure! And I may have to get a Bhut Jolokia, just to keep on hand for the next time the obnoxious elephants come calling here in New Jersey! Sophia Angelique, thank you for your feedback. Your comment is very helpful. I will look into optimizing my title. Writing online is new for me and I look forward to learning! Vespawoolf. There could be many reasons you asked about your hub. It might have been that no one commented, or that you weren't receiving much hub traffic, or that you weren't receiving any google traffic. It the first, then you have now received comments. If the second, to some degree, that is fulfilled. If the third, let me say the following. Thank you so much for your vote of confidence, bruzzbuzz (love your name). Please let me know how your chili turns out! I hope you can move soon. 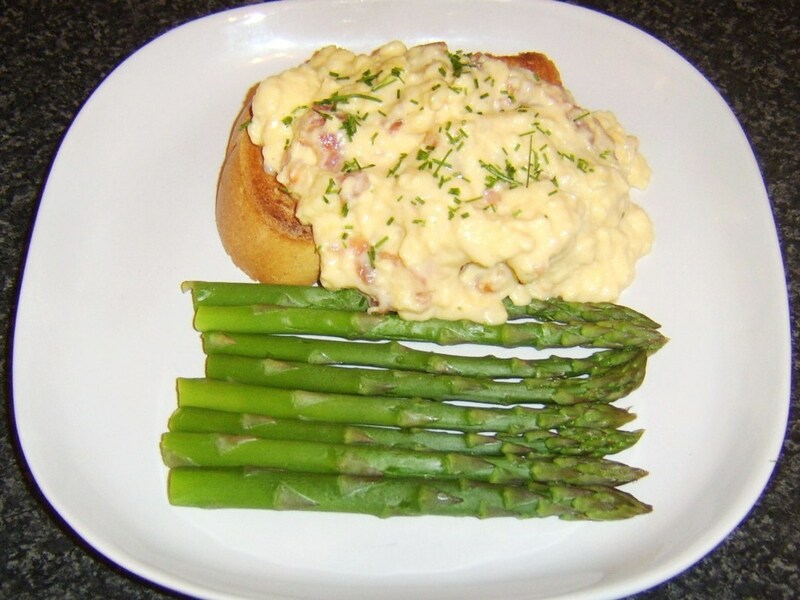 Please let me know when you have a chance to try the recipe and thank you for your feedback! Dipless, thank you for visiting and let me know how your chili turns out. You can try some of the chiles used for Indian cuisine if you can't find any of the other peppers. Who knows, you might invent a new, exotic chili recipe! I saw your post in the forum, and I just want you to know that this in an excellent hub, with loads of very useful information and more than just a recipe, which is great. I have never tried to make my own chilli powder before so i may give this a go, however finding specific chilli in the UK can be a pain, but I will definitely give this recipe a try. Thank you for sharing. Wow, I've never made chili because I cannot have spicy food. I had no clue all that goes in to it. You've done a phenomenal job on this hub. Now, if you need a fabulous recipe for those cinnamon rolls -- just let me know! I'm not even a big chili fan, but this makes me crave chili like crazy! I really like the way this hub reads and can't wait until I move out of my non-cooking dorm and into an apartment where I can try this recipe out! Good job! Wow! This is the best recipe hub I have ever seen. I can guarantee you I am making a list and going to the grocery store tomorrow so that I can make this wonderful chili. I will come back and tell you how much I enjoyed it too. Thanks for the hub and I am voting it way up! WOW, nice hub! I love how you have made this hub both personal and very helpful. The details you have included make the hub interesting and nice to look at also. I'm bookmarking it for Super Bowl Sunday! Thank you for your feedback, IndieJoe. Glad you enjoyed the chili! It's that time of year when chili sounds especially good so I had to try this one. Making a mild and hot batch is a great tip too. Voted up!!! (I'm also from the midwest and can vouch for cinnamon rolls as the perfect compliment).